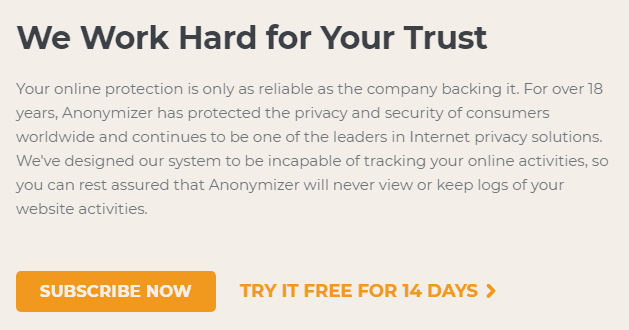 Anonymizer VPN Review - 7 Reasons Why You Shouldn't Choose Them. Anonymizer was created in ‘95 by Lance Cottrell. Anonymizer acquired their own privacy proxy in ‘97, making them a twenty-year stalwart of the VPN space. And they’ve been operating as usual ever since 2010 when they were acquired by Ntrepid, who’s larger tech conglomerate that creates products in the privacy, security, data sciences, and knowledge management spaces. How valuable is the experience? Is there such a thing as too much? In this Anonymizer VPN review, we’ll analyze whether two decades of experience has given them an unfair advantage, or whether they’ve lagged behind the times. LOG FILES/JURISDICTION Minor Logging. U.S. This isn’t Anonymizer’s first rodeo. And you can tell by some of their software attributes. First and foremost, no leaks or potential virus issues were found in our scans. They also offer industry-standard protocols and encryptions. Plus, Netflix works and torrenting is allowed. Awesome! Anonymizer uses the latest-and-greatest protocol, OpenVPN, by default. You can see the connected protocol clearly under the VPN client settings. OpenVPN works on the same underlying technology as SSL certificates, which all websites are basically required to have now. Plus, being open sourced actually means it’s more secure. Open source technology is constantly maintained by a community, rather than one or two teams. There could be hundreds of people contributing to its code at any given time. That also means it’s under more scrutiny. The entire community is constantly testing its limits, seeing if there are any potential flaws or loopholes. But as of now, there aren’t. 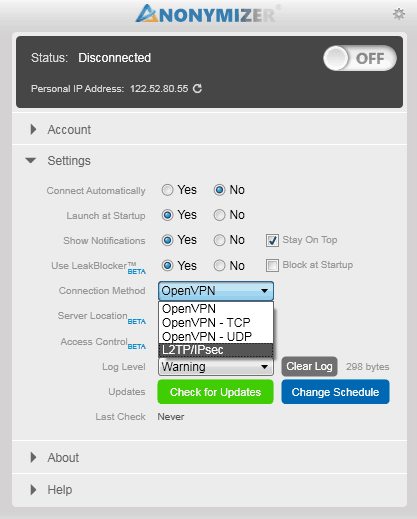 In addition to OpenVPN, you can also switch VPN protocols over to L2TP/IPsec. Those are the only two protocol options as of now, though. Otherwise, their OpenVPN config file confirms the cipher is the bank-grade AES-256-CBC. It only took the Advanced Encryption Standards (AES) to become the industry-standard cipher in a little more than a year. It’s based on the block cipher algorithm, and would currently take billions of years to decipher by most current computer hardware standards. So breathe easy. You’re in good company whenever you access public Wi-Fi. There’s a reason we’re critical in these VPN reviews. It’s because there are serious stakes online. And bad VPNs leave their own users exposed. Let’s say you’re a journalist covering government atrocities of an authoritarian regime. For starters, they want you to use their ‘government-sponsored’ VPNs. Which ain’t gonna happen. So you sign up for another and think you’re in the clear. Before research sensitive topics, you connect to a server in some neutral country. DNS leaks will alert authorities. They expose your true location, even though your VPN connection says otherwise. That could pose serious harm to not just your reputation, but livelihood and physical well being, too. Sound crazy? Unfortunately, it’s not. Eight out of 17 Chrome Extensions we reviewed leak your personal data. So it’s more common than you’d think. We did find one potential issue in the Anonymizer install files on the first go around. 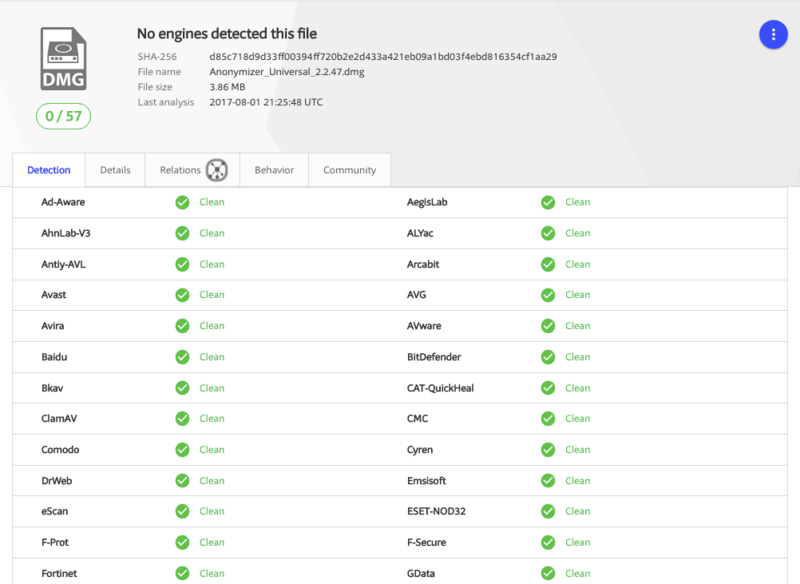 But it seemed odd, so we re-ran with VirusTotal.com and they came out clean. Our guess is that the first notification was a false positive. Fear not. Technically speaking, Anonymizer has nothing on their site about working with Netflix. They don’t explicitly say they work with it on their site, in their End User License Agreement, Terms of Service, or FAQ section. We were able to successfully stream content on one of the two servers we tried. Many VPNs are no longer promoting Netflix because streaming services have gotten so good at identifying (and blocking) their users. And they’re only getting better at identifying huge pools of people using VPN servers to unblock geo-restricted content. That means people visiting abroad are often SOL. Or U.S. locals can’t get the same early viewings of Sherlock that people in the U.K. enjoy. But there’s still a chance with Anonymizer. Peer-to-peer (P2P) networks connect people to all share a common goal. Typically, that involves downloading massive files from various places . It’s most commonly associated with illegally downloading music or movies. But that’s not all its good for. Many huge companies, like Blizzard Entertainment or even Facebook, use it all the time for transporting massives files across physical boundaries. But because of its negative connotation, many VPN companies will disallow it. Or, they’ll only allow it on a few select servers. The good news is that Anonymizer allows unlimited torrenting. So download-away! Anonymizer starts strong with solid protocol and encryption methods. They follow it up with a leak-free connection and no virus or malware issues in their install files. Throw in Netflix unblocking and safe/free torrenting, and you’ve got all the makings of a winner. Unfortunately, that’s when we ran into a few snags. Here’s a quick look. Most of the time you don’t need to worry. A VPN is just tracking surface-level data, like bandwidth being consumed across all users. That way, they can keep a pulse on a VPN software performance. But in other cases, you should be worried. Or run for the hills. 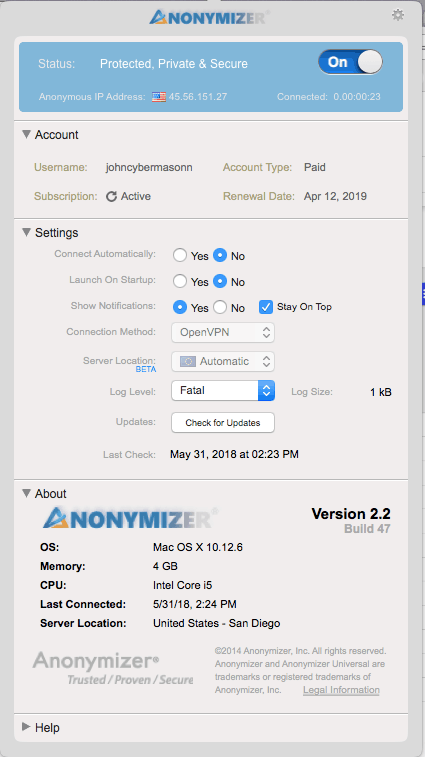 Where does Anonymizer VPN’s logging policy fall? Anonymizer’s U.S. home base puts them smack-dab in the middle of the Five Eyes security alliance. Mainly for the reason, we just highlighted in the last section. The U.S. isn’t exactly known for their passive intelligence agencies. They will demand user data from companies for pretty much any reason under the sun. And when that happens, the Five Eyes alliance has a built-in mechanism to share collected information with security agencies across New Zealand, Australia, Canada, and the U.K. The relatively recent 14 country extension adds a bunch of others to that list as well. Wait — it gets better! The NSA leaks from 2013 also revealed that each of these nations is basically spying on each other’s citizens. Each country has its own laws that govern exactly how they can (and can’t) spy on their own people. No problem! Just get your buddy across the border to do the illegal stuff you can’t. Then pool your resources to see what they came up with. You wish I was joking. I’m not. That’s why these ‘Eyes’ alliances are harmful to your personal privacy. They open the door for all kinds of shenanigans that sound more appropriate on some dystopian Sci-Fi movie. Anonymizer is slow. Really freaking slow. It came in at 67th out of 78 VPNs. Which is pretty much the bottom of the barrel. Here’s how we come up with that ranking. We start by getting a read on our non-VPN connection. That came in around 97 Mbps download and 53 Mbps upload. Next up, we connect to a few different servers to see how much those numbers have fallen. Pretty much all VPNs will slow you down. The trick is to balance minor speed decreases (~10%) for that extra security. Anything from 70-90% slower is pretty bad if we’re being honest. But let’s give them the benefit of the doubt, and try again on another server. Maybe that one was a bad apple. Ok. That was pretty bad, too. Anonymizer performance is consistent. But consistently bad. You can use Anonymizer on up to six devices. That’s pretty compared to most competitors that only allow three to five simultaneous connections at any given time. They only have native apps for Windows and Mac devices. No mobile. That means you’ll need to roll up your sleeves and get geeky just to use your iPhone or Android device. There are also config files for Linux. So more manual labor ahead. It probably shouldn’t come as a surprise that they don’t support smart TVs, gaming consoles, or routers. I confirmed this with their support, and the result was pretty funny. More on that below. Anonymizer offers an FAQ section on their site. They do not offer live chat or email. Instead, to speak with someone at the company, you’ll have to “Create a Case” support ticket. No other choice. To their credit, they responded pretty quickly. Their site states response time averages around two hours. And they were well below that. Instead, the problem was the response itself. It might sound like we’re being harsh. But this has to be a fairly standard question. Most VPNs today have both smart TV and router options. So my query shouldn’t have been that confusing. Minimalism is a good thing. Unless it’s too minimal. We already griped about the fact that there are only Windows and Mac clients available. Nothing for mobile. Beyond that, the app itself is pretty standard. But it’s also super limited. I would show you more images. Except, there’s nothing else to show! And as a result, there isn’t a whole lot you can do on it. You can basically downgrade protocols. But you wouldn’t want to in most cases. Otherwise, most of the options are admin-related. Some VPNs offer thousands of servers in hundreds of locations. NordVPN reportedly has 3350 servers. No joke. Well, at least officially, anyway. Unofficially, that number might be lower. VPN server data can be misleading for various reasons. How many server locations does Anonymizer have? Any positives? They probably own both in-house. As opposed to other VPN companies that rent them from third-parties (who might, in fact, log and do all other sorts of stuff with your data). But that is just too limited to useful. If you’re not close to either location, your performance will almost always struggle. It also indicates that all of their customers are fighting over resources on just a few overworked servers. So no. You can’t always trust VPNs server numbers. However, anything greater than two is probably worth a shot right now. Some VPNs give you different pricing and plans for monthly, quarterly, or annual subscriptions. Anonymizer doesn’t do that. Instead, they just have one single annual plan that you can buy at $79.99. 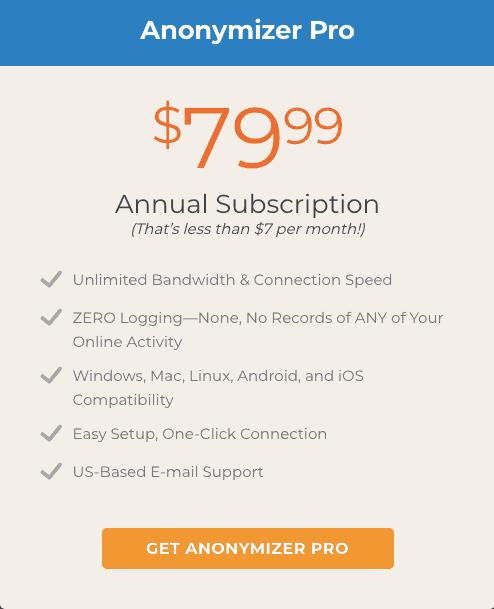 Anonymizer does provide two big benefits for people still straddling the VPN fence. The first is a free 14-day trial. The second is a 45-day money-back guarantee. So even though you’ll have to pay for a full year, you get about 20% of that time (~60 days) to decide if you want a full refund or not. Card support extends to American Express, Discover, Dinners, JCB, MasterCard, and Visa. You can use gift or prepaid cards if they carry one of those logos. You can also mail in cash or check. However, the Cons just stacked up too high at the end of the day. Their logging policy and U.S. jurisdiction were causes for concern. The speed tests on their only two servers were really slow. And probably not getting better anytime soon. They don’t work natively on many devices or platforms. And while well-intentioned, customer support proved unhelpful. Anonymizer’s been around for two decades. Regrettably, it doesn’t seem like much has changed since then. It’s OK for hiding your IP, but it doesn’t do much else. For better data protection, it’s wise to browse our 10 best VPNs here.